Yesterday I wrote about my new tool the Go! Baby Fabric Cutter and today I'm giving one of these 'babies' away thanks to the nice and very generous folks over at Accuquilt! The incredibly lucky winner also gets to pick 3 dies to go with their Go! 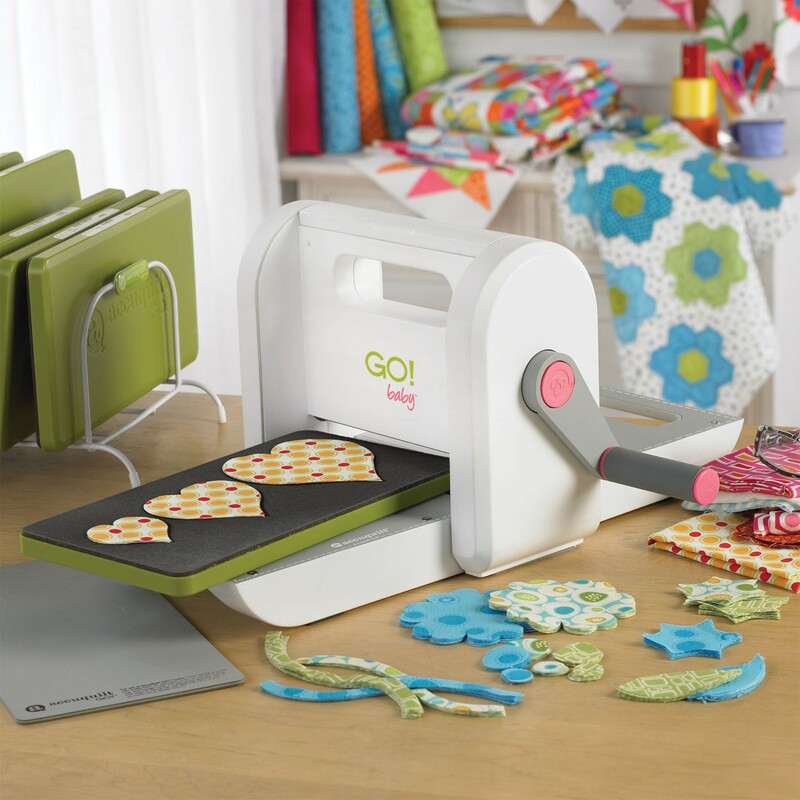 Baby Fabric Cutter. Check out the dies here, there is a huge selection you can choose from. If you would like a chance to win this wonderful little helper (and of course you want to!) please leave a comment to this post and tell me what your favourite quilt pattern or block is. I'd love to discover new ones! This giveaway ends this Friday (August 26th) at 8 PM Amsterdam time. (edit: sorry giveaway is closed!) Winner will be announced the day after. Make sure to either check back in time or leave a 'trail' so I can contact you in case you win this fabulous prize. Good luck every one! P.s. I you haven't already please check out the tutorial I posted yesterday for the wonderfully cute Tonka &amp; the Stars pillow! I haven't really quilted in quite a while. I'm so excited I found this giveaway though! I can't find it now, but I believe the pattern I really liked once was called stepping stones, it was fairly simple but turned out to be a great quilt. I love quilts with triangles. Flying geese are probably my favorites, but half-square and quarter-square triangles rank up there. Hi Nicole, wow what a great giveaway! My favorite shapes are the basic geometric ones, squares, strips, triangles, circles, stuff like that, especially since I'm still a beginning quilter. Oh, oh - my fingers are crossed, wish me luck! p.s. I love your Tonka & The Stars pillow, so pretty! I like square and a square blocks 'cause they leave room for some embroidery if I want. Even though I secretly hate to make half-square triangles, I am drawn to pinwheel quilt patterns. Scrap Bag Surprises is my recent favorite pattern collection - love how the patterns are written for yardage to buy or using up scraps! I love flying geese - I recently bought 'Flying Colors' and I'm hoping to learn about making curved flying geese! I am currently obsessing about the very traditional Bear Paw block. I know I must make something with it! Would love to win this thanks for the opportunity. I’m a little obsessed with the double wedding ring right now, because I have a great idea, but am not looking forward to cutting it all out (hello, Baby Go!). But beyond that, I really like playing with pinwheels. They’ve made it into four! of the recent quilts I’ve been planning to start. I am in love with Amish Stars - they are mainly constructed of Half Square and Quarter Square Triangles - which is perfect if you have a GO! Baby. I would love, love, love to make a lonestar someday, but I am terrified of all that precise piecing and cutting! I've never made a quilt, but I love looking at hexagons so I guess that's my favorite. Either flying geese or log cabin. They both allow you to showcase a great combo of colors. I just found a block design called Solomon's Star, it's my current favourite. Thanks for the giveaway! I love coin quilts, and anything with pinwheels. Love your site! I was reading your tutorial yesterday thinking ...boy would this be a fun thing to have in a perfect world!! well...maybe a nice thing will happen!! I think my all time favorite is grandmothers flower garden...I always feel happy when I see it!! I've never met a quilt pattern I didn't like but I have a bunch of applique designs floating around in my head right now. I love the double wedding ring. Thanks for having this wonderful giveaway! I love geometric patterns, circles are my favorite on quilts at the moment. I don't have a favorite pattern, because I love almost all of them. Right now, I'm very interested in doing a drunkard's path quilt like the one that was shown in the accuquilt newsletter. It was done in 2 different sizes, and in solids, and it was very contemporary and traditional at the same time. Great giveaway! My favorite quiltpattern is Storm at sea! I am planning to sew it in the near future! Hugs form Kirsten in Oslo! I love the churn dash and hope to make several in different styles, but I would love to win the Go Baby so I can try the apple core quilt!! Thanks for the chance! Why I am obviously in love with Scrap Vomit I see myself on the verst of an HST binge. Yay, another chance to try to win this wonderful baby for my sis. She has always been my champion, encouraging me to do more to prove I really could. To point out to me my failures are not always that but a new and quirky way of doing things. She loves to quilt but her hands are wearing out and this would be a huge help to her. My way of giving back. My very most favorite traditional quilt block is called Interlaced Star - it lets you do lots of overlaid transparency affects with color. I just started quilting, so I don't have a favorite yet. I have bookmarked a bunch of quilts with circles on them, so maybe that is what I lean towards. I would love to make a hexie quilt, but the thought of cutting out a bajillion hexies isn't very appealing. With the baby Go, it would be much easier. I really love log cabin blocks, not really new but a goodie in my opinion. My favorite has to be pinwheels . I just love them! My favourite is the double wedding ring block! How can you pick just one block when there are so many to choose from. I think I would pick a very basic 4 patch or 9 patch because you can cut it up, match it with a flying geese to make a star or a snowball. You can do so much with a very simple block. My favourite quits patterns are made with litlle squares and pinwheels. I learnt a lot about patchwork with Bonnie (http://quiltville.com/)have a loot at her website is fabulous. Lovely giveaway! I love log cabin blocks, very conservative, I know. I love the modern twist on log cabins. oh, how exciting! I really haven't got a favorite quilt patten (to be honest) ~ really like to pick the fabric and let it 'speak' to me ~ then I figure what pattern would look best. However, I do love all the ways log cabin can be made and triangles are fun too. I'm still pretty new to quilting but right now it's a 9 patch because of the versatility. Thanks for the chance to win. I love the plain and under-rated half square, as the combinations are endless!! I also really like the sawtooth star as well as the Arkansas Traveler Block ... Eeeeeek!! I'm so excited ... Thanks for the chance for this!! I love the pinwheel pattern, I made a pinwheel blankie for my daughter whilst I was pregnant. I really like the 9 square pattern and I adore the double wedding ring pattern but cant face cutting all those pieces ( so hope I win. Loving your new Tonka and the stars pattern, cant wait to make one for my daughter as she loves the moon. 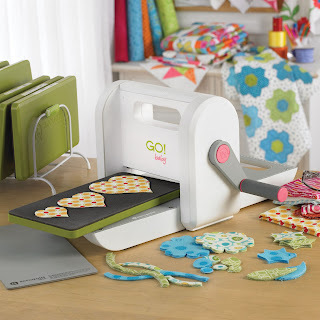 I love scrap quilts and a Go Baby would speed cutting up no end. Thanks for the chance to win. I have only been quilting for 2 years. I started with simple quilts. The more i am learning the more i love the traditional style quilting. I love the paper piecing style from the 1920's. I love so many different ones, but I really like the log cabin blocks. They can be done scrappy or whatever, and I think they are fun and not too complicated. Thank you for a chance at your giveaway! My favorite block is the Schoolhouse. I've never made one, but just inherited one made by my sweetheart's grandmother. I love the symbolism of it, and the cheery, independent way it looks, especially when there is a line of little schoolhouses in a row. I love the look of a mariners quilt! Pinwheel quilts are cool too! thanks! The Seeing Squares quilt pattern by Empty Bobbin is a current love, but the Single Girl quilt is always a favorite of mine. I love the old standby double wedding ring block/quilt...I just think they are lovely! 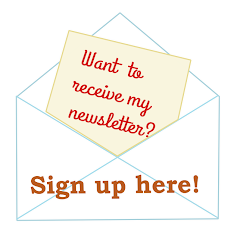 Hi, I would love to receive a Go Baby, my favorite dies are: go hexagon-55011,go half square 4"-55031 and go tumbler 31/2"-55015. Thank you for the opportunity to win. My all time favorite pattern is the Wedding Ring quilt! What a wonderful giveaway! Thanks so much! My all time favorite quilt block is the Pinwheel! I loved your tutorial; what a cute pillow cover! I would choose the dies you used so I could try and make one too. Thanks for the chance! I love pinwheels (my first quilt was a pinwheel sampler)! Ans lately I fell in love with the Swoon pattern! Wow!! Nicole this is looking good!! My fav. patterns are anything with curves, I love them all: Dresden, wedding rings, single girl,etc. Cheers!! I am new to quilting and have only done a log cabin block. I love the look of an appliqued quilt. The Go! Baby would help out with that. My favourite is the one I am doing at the moment - I am not sure what it is called - it is the one with diamonds that join together to form a cube...does that make sense?? I saw it in a stately home I visited and then found a book in the second hand book shop showing how to do it. Clearly it was mean to be! My favorite block of the moment is the 'wheel of fortune' or 'road to fortune' block. Thanks for a chance to win! I don't think I have a favorite block--I'm not yet a quilter, but would love to make something from the book "Block Party". I especially love the Confetti Block! I kind of like the wonky stars. I really like chinese coin quilts, but have never made one myself. I'm not sure I have an absolute favorite pattern or block... it seems that the one I'm working on at the time is my current favorite. I love denyse schmidt's drunk love block!!! I'm very very new to quilting. A long time knitter I just rediscovered my love of embroidery and needle point and want to try my hand at quilting. I love this pattern: http://freespiritfabric.com/graphic-elements/gallerys/t201_1.pdf "Picnic Parade" by Jenean Morrison. The design is very simple and straight forward but with beautiful fabrics it really pops and draws you in. My favorite block, hmmmmmm , I think it would be log cabin. It is so versatile. I'm very much liking pinwheels and swoon. Have yet to try either but some plans in the works. Thanks for the chance to win! hi-love your embroidery patterns! thanks for the giveaway-this might be boring-but i just love a log cabin! I love the wonky log cabin blocks.. that way I can't make mistakes. The die that I would choose would be the circle because it is soooo hard to cut out circles. My favorite block of all time is the Dresden Plate! There are so many variations to try! I adore the Mosaic 4 quilt block! Thanks for such an amazing giveaway! Cheers! I so want one of these! Thanks for the great oppotunity! HaHa! I came over from your most recent post, and I happen to follow you AND like you, but I'm leaving a comment anyways;) My favorite quilt block? So hard to choose, but I'm going Spiderweb. This machine looks sooooooooooo cool. Lots of ideas brewing here for mixed media work. I really like drunkard's path. :) And a Accuquilt would make cutting those out so much easier! Right now I've really been in love with tumbler quilts... Easy to put together & they show off the fabric well. favorite block? stars. i like pinwheels, ohio and friendship. haven't tried the cutter yet-- should be fun! My favorite block remains the Snail Trail block. Always so cute.